View on the Wrexham, Mold & Connah's Quay Railway, possibly about the turn of the nineteenth century. The engine is one of two Manchester, Sheffield & Lincolnshire Railway '9F' Class locos which were built for the company by Beyer Peacock about 1896-7, but the origin of the coaches is uncertain. The WMCQR is known to have bought some 4-wheeled coaches from the LNWR but few details are known. Are these perhaps those coaches, newly repainted in LNWR livery for the sale? If so, does anyone have details? If not, then what are the details of the coaches? There is a photo in Railway Magazine Vol.XVI, March 1905 p196 showing an ex-LNWR four compartment coach on the WM&CQ in shabby LNWR livery. It has the lower and waist beading at the ends turned up in the style of road carriages. This seems to correspond to the second and third vehicles in the mystery photo. According to Boyd's history of the WMCQR, the 1905 GCR review of WMCQR stock listed 33 carriages, all obtained from LNWR sources in 1889. The LNWR Locomotive Committee Minutes of May 1889 record one composite and three 3rd class duplicate carriages sold to the WMCQR for �390. Apparently 24ft composite and 22ft thirds made at Saltley in 1860-62. The Bishops Castle Railway also bought similar stock. The stock stayed in LNWR livery until some was repainted overall lake. 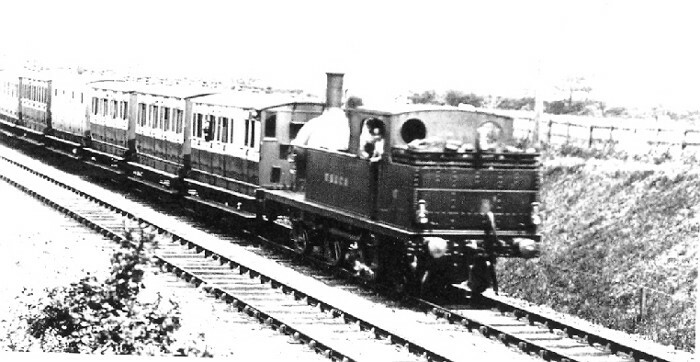 By 1905 most was listed as fit only for scrap, but continued in use at least on the Brymbo branch for several years. I am currently making a P4 layout which depicts WMCQR/GCR LNWR runing in 1906, and would like to get hold of drawings of this stock to make models. Any help would be gratefully received. The engine is described as a MS&LR class 9F, five of which were on the WM&CQ from 1896. These were 0-6-2T - but on this engine there is no front splasher. It looks more like a 2-4-2T, but none of the books - Baxter (vol 5B), the RCTS LNER loco histories, Dow's Great Central, Boyd's WM&CQR - mention any of the MS&LR 2-4-2T engines as having been transferred or loaned to the Wrexham line. The lettering on the tank side looks like "WM&CQ" - if so, it seems that line must have had at least one engine which isn't mentioned anywhere. The MSLR locos which ran under WMCQR colours did so because the MSLR didnt have running rights over the Wirral railway between Bidston and Seacombe. This situation lasted from 1896 to 1898 when they were able to revert the three '9F' Class 0-6-2T, and five '24' Class 2-4-0s to GCR colours. The loco illustrated appears to be, from the slope on the coal rails at the back, to be a '9G' Class 2-4-2T, but these ten locos were built March to June 1898, and were first allocated to the Manchester South Junction & Altrincham line. I am not an LNWR member (although I know a few!) as my interests are more on the GCR. I reckon that the mystery photograph is very likely one of the 0-6-2 tanks not a 2-4-2. I have posted my reasoning on the GCR web forum but will send them here as well in case they are of interest. Firstly, the coupling rod appears to carry on to the front pair of wheels. There is a curved shape visible ahead of the tank. I think this is a splasher (it appears to have a small plate on it) and the fact that it is set well back from the platform edge has caused confusion. A photograph of this type of loco from this angle is quite unusual. The driving wheel diameter looks to be too small for a 2-4-2 if you compare the size against the trailing wheel and the front wheel looks to be a similar size to the second and third axles. The picture is not of the highest quality and perhaps the original print may show these features conclusively but if it is looked at again with these points in mind I think it is fairly clear. Of the carriages, I know nothing! The GCR discussion list has come to the conclusion that close examination shows this to be one of the WMCQR 0-6-2Ts, rather than a completely unrecorded locomotive, which would have been too much of a distortion of the space time continuum. I am sure Philip Millard will put us all right soon, but the second through fourth carriages are standard LNWR 24ft Tri-Composites or 25ft Double Composites. Not easy to tell the difference from this angle. The fifth carriage has five compartments and of more modern appearance without the upturned bottom and waist beads, so is one of the Thirds. The first carriage is a Brake Third of similar style to the all Third. The Bishop's Castle Composite carriage was measured and recorded in extreme detail by Arthur Gunn, but I know of no decent or reliable drawing of the Brake Third, which is a pity as they appear in many pictures so anyone modelling the LNWR at this period really needs one or two. There is a large collection of early LNWR carriage drawings with the Metropolitan collection in Birmingham Library, but most seem to have been drawn in the 1950s or 1960s and may not be reliable. I would love to know who drew these. They have the initials 'ACH' on them. Arthur C. Hancox was a respected 7mm scale modeller of early LNWR, but when asked 20 years ago he said he had no knowledge of the drawings. In the same collection is a Wright's drawing of an even earlier (1840s) Third and that does appear to be accurate, having checked the dimensions to an actual grounded body a few years ago. Whilst knowing nothing about MS&LR locomotives, Harry does seem to have a point that there is no leading splasher. I agree with Mike Williams. The coaches are ex-LNWR Saltley pattern. They would have been taken out of LNWR service in the 1885-90 period, maybe earlier. The "drawings" or sketches in the Birmingham library seem to me to be almost entirely imaginary, and cannot be reconciled with known information about LNWR carriages of the period. I am not surprised that Arthur Hancox disowned them! The carriages, as most of your emailers have said, do seem to be the LNWR carriages that the WM&CQ purchased. It was remarked at the time that they were "newly varnished" for the sale. The loco DOES have a front splasher, it can just be made out ahead of the corner of the tank. It even seems to have a maker's plate on it. It is very close to the frame, and must have had minimal clearance, but it is there. The WM&CQ lettering was applied, as has been said, to avoid unpleasantness at Birkenhead, but the engine probably remained in GCR/MS&LR green. I did write an article for British Railway Modelling in my livery series, but I can't remember which issue.